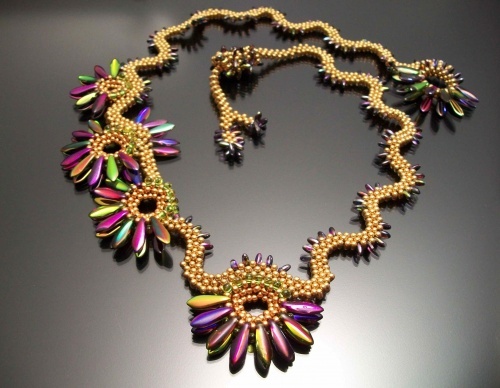 This asymmetrical necklace features 5 radiating rings of daggers and a beaded closure that "screws" into place. The feminine dangling closure is best appreciated with an "up 'do" or short hair. Appreciate the unique qualities that peanut beads lend to peyote and right angle weave projects, making them appear more complex, even layered and allowing for easy manipulation into curves and waves.